Now, I will start this post by saying this may not be a perfect idea of a vacation for everyone! But it was for us – and I think it will be for a lot of you. It is not a place I would say bring the little ones – but for older kids and adults – especially if they love history, it is a winner. It is also a great way to spend a day without spending a lot of money! We are all about living a more frugal life – and visiting Jerome was a cheap way to spend a day with most things either being free or having a small fee. We spend more on lunch than we did activities. The trip to Jerome was not at all planned – I had never even heard of it before, but we spent the week in Sedona and were looking for something easy to do on our way back to the Phoenix airport because we had a day to kill. Our original plan was just to spend the day in Phoenix, but that did not really appeal to any of us so we wanted to do something different. Best decision we ever made! I checked on Google as we began our trip out of Sedona and saw the Gold King Mine come up and told my husband about it – we were skeptical but since we had a few hours and it was not far out of the way we gave it a shot – and we are all glad we did. While Gold King was our target – as soon as we drove into Jerome, we knew we were onto something special. We had no idea the time warp we were about to embark on! Even with only a few hours to spare we covered a lot of territory – we wanted to see as much as we could. While we did not spend a ton of time at any one thing, we covered a little bit of several things which made us happy. I visited most of the things noted below – the only thing we did not do were the tours, but I will do those the next time we are out that way so I can learn even more about the amazing history. This is where we spent most of our day and we still felt it was not enough time! This is not a place everyone will love and we want to be clear about that. I hate when I go to TripAdvisor or any other review platform and see negative reviews just because this was “not for them” or they think it is a “junkyard” with no value. Is it a gold mine? Well, kinda. Is it a ghost town? No, not really. 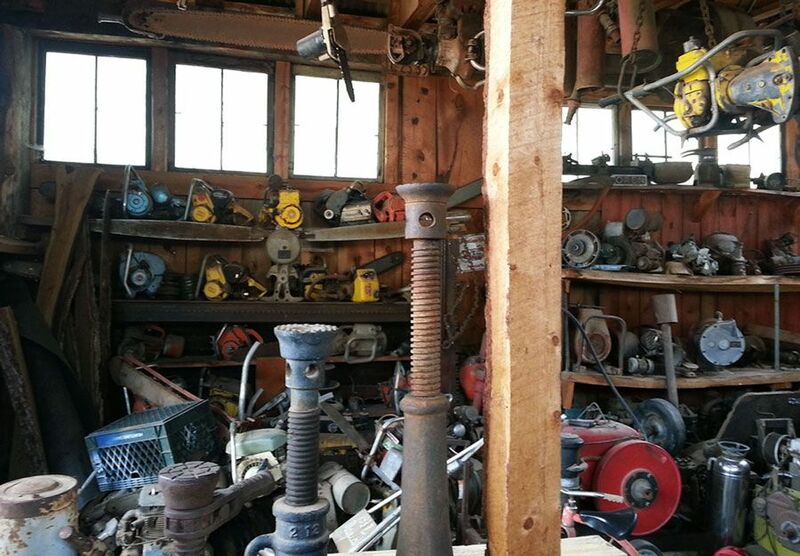 Is it pretty much a junkyard? Yep, but it is so much more than that – it is history! 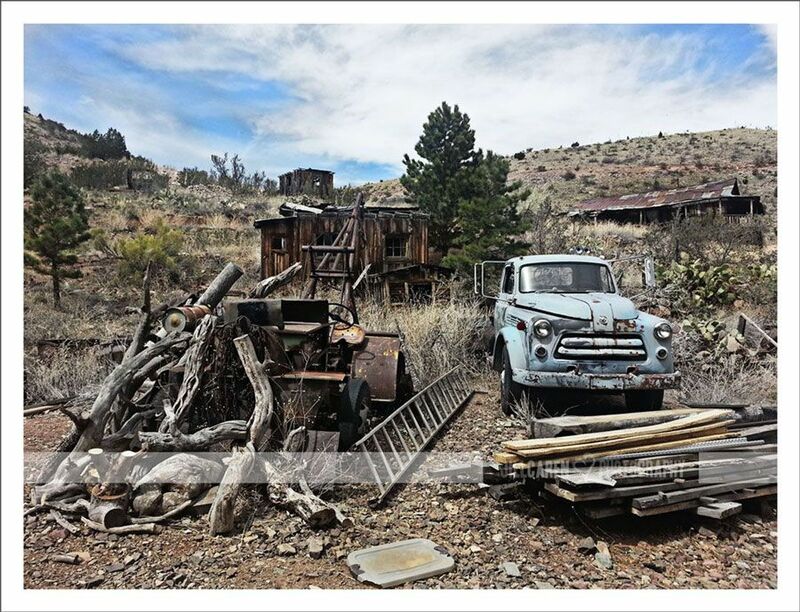 If you are a history buff with a passion for retro cars, tools and things that yell out “I am metal and I am old”, the Gold King Mine & Ghost Town is for you. 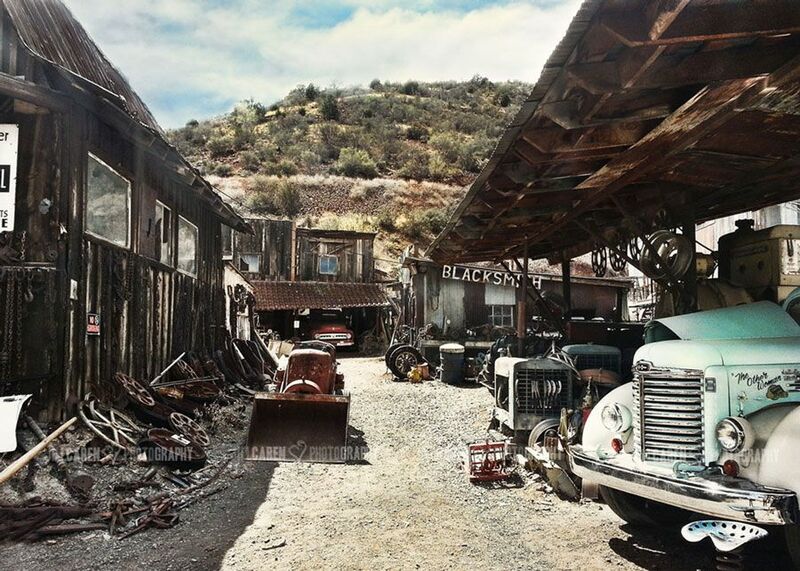 My husband has a passion for old car parts, motorcycles and tools – so this was heaven for him – and although my daughter and I may not have that passion, we just loved the historic value that this place has. You can explore for hours and still not see everything. My husband also loved that he got to meet the person who owned the property, Don Robertson. 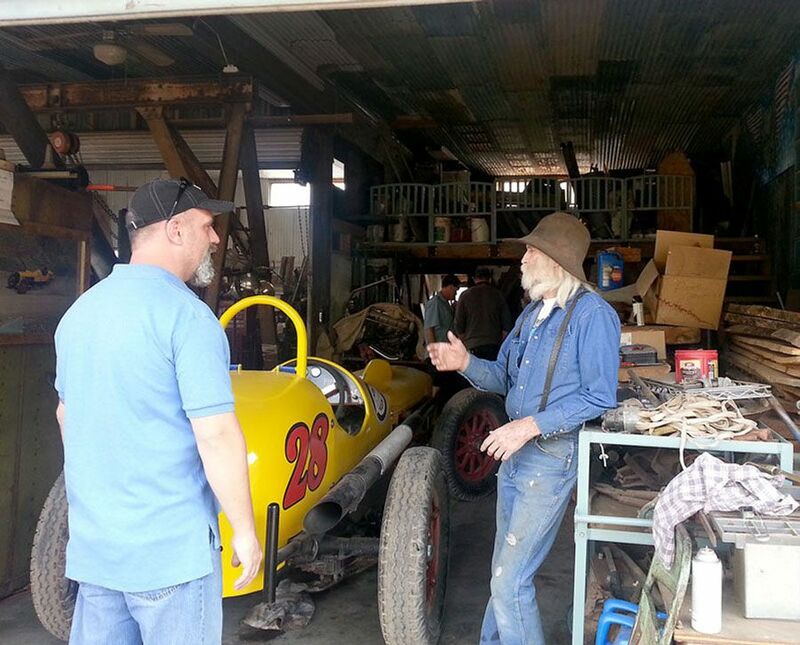 He enjoyed great conversation about one of his passion projects (the yellow race car in the pic below) and loved hearing stories that Don had to share. Sadly Don passed away at the age of 73 back in 2016 – but thankfully his stepdaughter has taken over the property and it will continue on in his memory. Explore the property – visit the buildings, the blacksmith, the over 180 vintage cars and motorcycles – you won’t be bored! Get married – yep, they host weddings! There is a nominal admission fee which helps them keep things running, but you can spend as much time as you want there! It had been a long time since I looked at a kaleidoscope and this place just took me right back to my childhood. Nellie Blye Kaleidoscopes and Art Glass is the largest dealer of kaleidoscopes in the world. They offer styles and designs from over 90 different artists – most of which live right here in the US! The store also features a collection of glass marbles and jewelry which were incredible as well. One of the things that makes this place so special is not only the beauty of the items they showcase – but the wonderful people who work there. They truly go above and beyond to ensure you are having a fantastic time and they highly encourage everyone to touch and feel everything in the store which was such a treat. My daughter absolutely loved this place. 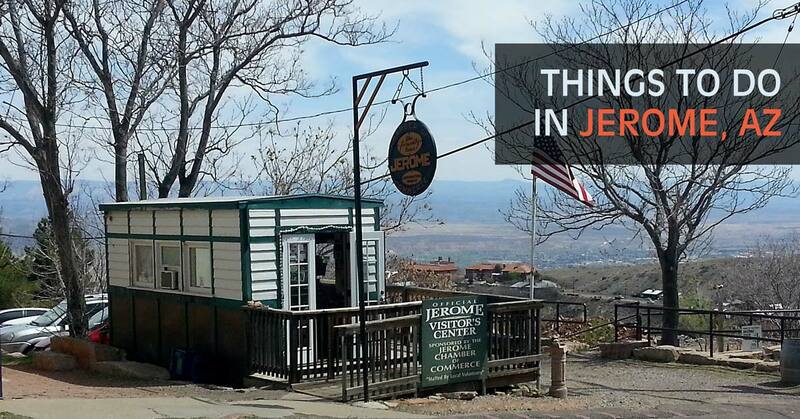 The Jerome Historical Society offers their Mine Museum which is a great way to see the the progression of Jerome over the years. From equipment the old miners would wear to the various ethnicities that called Jerome home the museum showcases everything that made Jerome what it is today. The exhibits include everything you could want to know about even the seedier side of things like the gambling and saloons to the prostitution that took place there. Little kids may get a little bored but at the end of the trip there is a little thing they walk under which was made to look like you were in a mine which we are sure they will love. It is a short trip through the museum and the admissions fees are super low but there is a lot to take in so all in all a great place to visit. Unfortunately, I did not learn about these tours until we were already in Jerome and we had no time to book one – but this is a must for our next trip out there, because we are definitely going back. Ghost Town Tours was the one I want to try. They offer 3 different tour types including Historic, Ghost and Specialty (which is primarily for groups). I am a huge ghost nerd so I want to do a Ghost tour and there are even 4 different options for that specific tour – and then 3 more options for the historic tours. Some are walking tours while others a combination of shuttle and walking. The one ghost tour I looked at actually has ghost detecting devices so you can stop along the way of the tour to take readings. I would LOVE to do that! 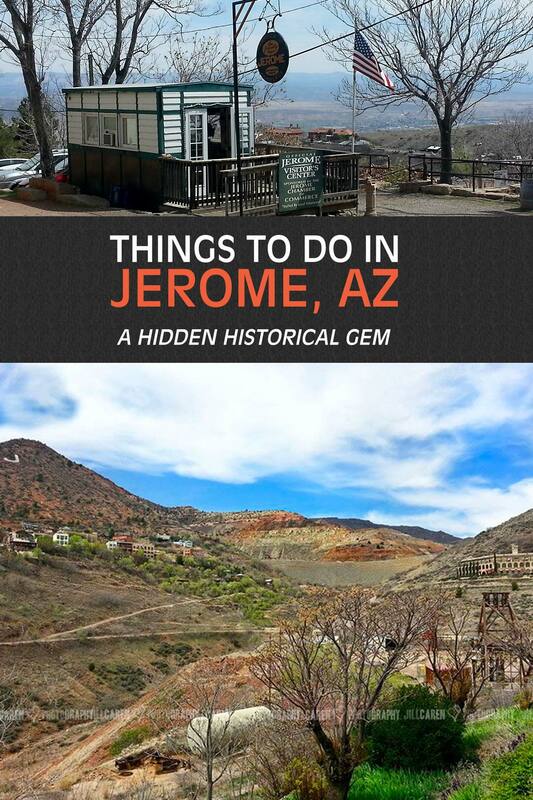 The tours can be a little pricey – so definitely make sure your whole family will appreciate it, but this is such a great way to really learn the unique history of Jerome, AZ! This was where we went for lunch and we did not expect much, but boy were we pleasantly surprised. I am not one of those that takes pictures of everything I eat, but I wish I did! My daughter and I wound up sharing a Grilled Cheese sandwich – and it was amazing. Like seriously how could grill cheese be so much better than any other grilled cheese, but it was. The bread was amazing – a grain bread that I thought my daughter would hate but she loved it. My husband had the Roast Beef sandwich and even his pickiness was met with happiness at first bite – for him the horseradish Aioli was like a piece of heaven. Of course we all grabbed a dessert too – cookies for all! If you need a place for a snack – or a meal, we highly recommend this place! It was located on Main street so keep your eyes pealed! This was our first stop before we headed into the town of Jerome and it was definitely worth the trip. The views — that was enough for us to stop, but the museum was really great as well. The image below is from the outside of the museum area – the picture really does not do this view justice. The museum was formerly the residence of James S. Douglas who built what was then known as the Douglas mansion in 1916. The mansion was designed by Douglas to be a hotel for mining officials and investors as well as his own family. He also built the nearby Little Daisy Hotel that served as a dormitory for the miners that worked in the Gold King Mine. The museum covers everything related to the history of Jerome area including the Douglas family as well mining. You can enjoy historic photos, view the minerals that the town was known for and even see a 3-D model of the Jerome – underground mines and all. We spent most of our time outside enjoying the views, taking a peak at the old mining equipment and taking a look at the cool stuff in the carriage house. It was so cool to see so much modern art in such a vintage place. The Jerome Artists Cooperative is located at 502 Main Street in Jerome and is located in what used to be Hotel Jerome which was opened in 1917. Since 1996 it has been the artist coop and typically showcases a variety of art from about 35 local artists. When you walk in the doors you are surrounded by art in all mediums from painting to jewelry to photography. Each artist helps to keep the coop going so any time you visit it is an artist working the floor – and they love sharing stories of their work so do not be afraid to strike up conversations. Even though we are not true art lovers like we are history nerds – this was definitely something we enjoyed because of the passion the artists exuded! Just exploring the business district are was an experience. It was like walking back into the 1950’s. You will find a good mix of shops, galleries and museums – not a lot mind you, but a few to keep you engaged. You will see some really old buildings and even some treasures between the buildings if you look! If you are lucky you will see an array of vintage cars like we did that just gave it an extra special vintage feel. You will also meet some of the locals whom are incredibly welcome and kind. 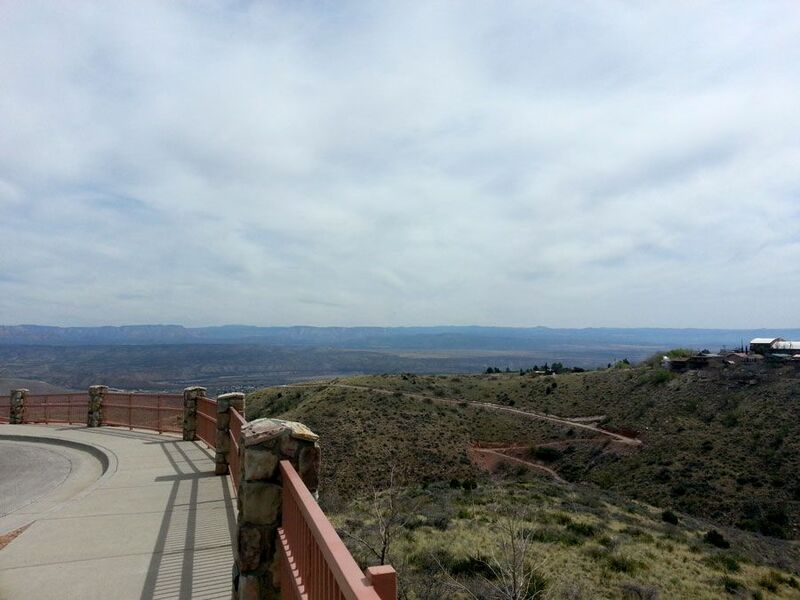 The drive from Sedona to Jerome Arizona was only about 45 minutes and I have to say the scenery was BEAUTIFUL. Jerome sits high up so you are seeing so many different scenes at different altitudes to get there. 89A is the road you will take and it is a historic road that is full of twists and turns which is like every guys dream for driving. My husband loves motorcycles and I could see him drooling at the awesomeness of this road. When we were there it was not at all busy and we felt like we were the only people on earth for a quite a long time on that road. It was incredible. 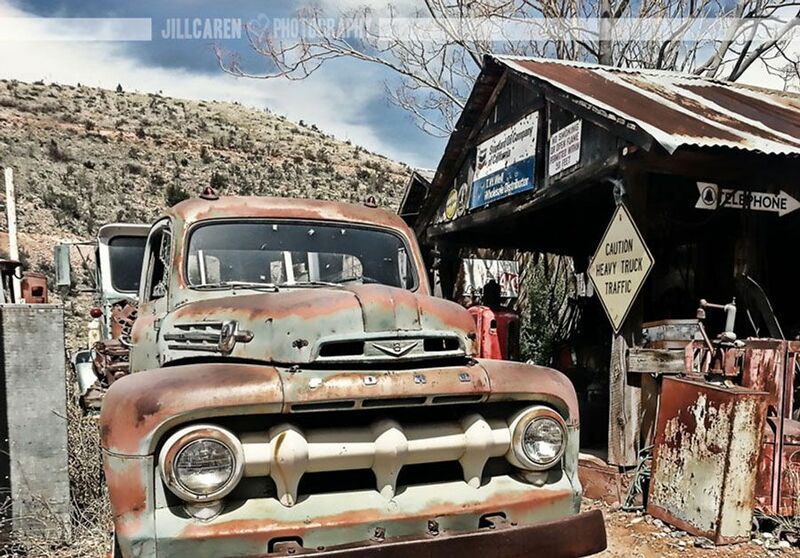 Jerome is an old – and quaint little town that was founded in the late 19th century and overlooks the Verde Valley – it is high sitting about 5,000 feet above sea level giving you amazing views. Back in the day it was known for its mines and was home to over 10,000 people in the early 1900’s. The mines provided great wealth and the town became known for its prosperous opportunities. But the town was also destroyed on several occasions by fire – although it was always rebuilt. But in 1918 the mining base began to fickle out after fires erupted under the town that was said to have stretched over 88 miles. Sadly due to labor issues and depression and wars the mines closed in 1953 and that population of 10,000 or so turned into about 50 in the 1950’s. The 2010 census showed only 444 people living there. In the 1970’s they began to open those buildings to artists – in 1976 Jerome became a Historic Landmark and today it is a vibrant downtown filled with artists, eateries and people who are passionate about their community. Our time in Jerome was so special! It felt like you were being taken back in time to the 1950’s. The buildings, the decor, the people – it was all special. These are just some of my favorites from our trip to Jerome, AZ. 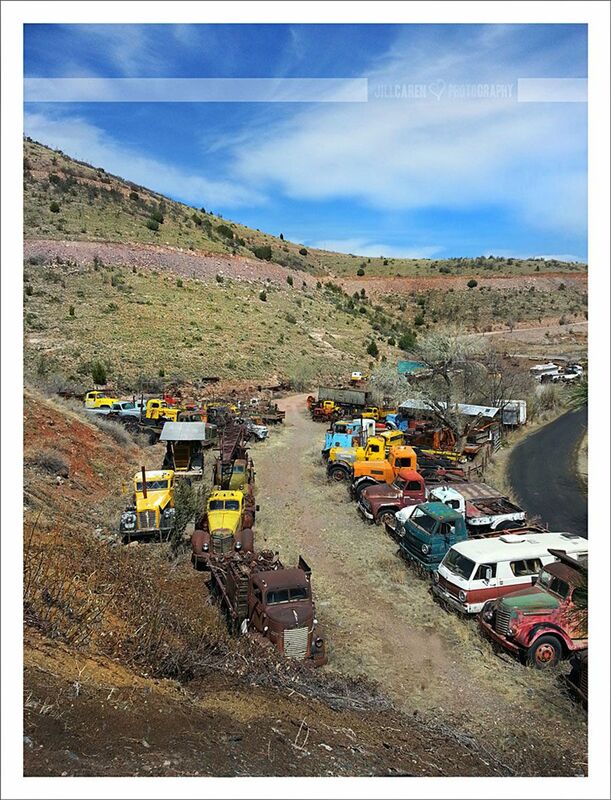 You can see the diverse collection of “treasures” at the Gold King Mine, the beauty of the landscape and the last image is actually on our drive into Jerome. The valley was amazing!